Here’s a conundrum for you. Let’s see if we can work it out. 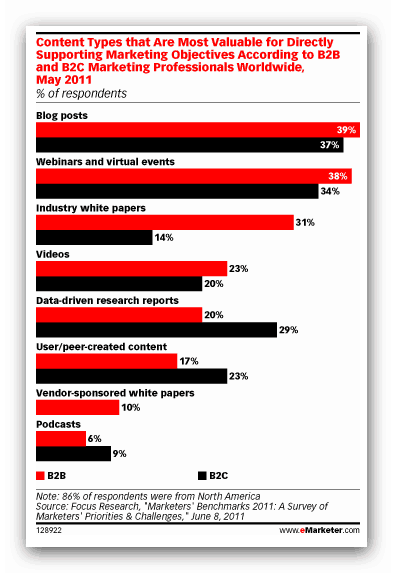 According to several studies, most business do NOT blog. Back in 2009 less than 16% of the Fortune 500 were blogging. And according to a study last year the number of companies blogging would rise to just 43% by the end of 2012. At the moment it is estimated that only one in three businesses take part in blogging. However, study after study continues to show that blogging is the NUMBER ONE way of attracting new business online. The most recent of these studies confirms that blogging is the leading way of generating new leads – way ahead of video. So the conundrum is – if blogging is continually confirmed as the best way of gaining new business online why do so few businesses do it? Meanwhile, we learn that 60% of companies use social media, such as Twitter or Facebook – yet even though these are great ways of generating business, they are not as effective as blogging, according to all the research. So, why are businesses attracted to a less successful method of generating new business? Firstly, there is a subtle bit of psychology at play. We tend to prefer words with high frequency sounds in them. Words that are dull and have low frequency, glottal kind of sounds are ones we tend to dislike. The word “blog” is dull-sounding, is made up of low frequency sounds and is less appealing than the word “tweet” which is high-frequency. Essentially, “blogging” does not actually sound attractive and as a result executives need a lot more persuading as to its value. If only blogging were called something like “swishing”, it would be much more popular. Of course, the sound of the word is only a minor part of the problem. The real issue is that most business leaders realise that to blog effectively you have to change the way you do business – and that’s the change they do not want to face. To write blogs regularly – you ought to do them at least once a day – plus to run webinars and produce white papers all takes time. Compared with writing a 140 character Tweet or connecting to someone on LinkedIn, blogging is “hard work”. And it takes people away from their “proper job” it seems. As a result, blogging becomes a “nice to have” rather than a “need to have”. The problem is all the data confirms, time and time again, that in the online world blogging is the “need to have”. What businesses really need to do – maybe yours included – is to make blogging completely central to their business. Some companies have already done this – parts of IBM, for instance, have made blogging a focus for their work. Essentially it is a “mindset” switch. Instead of thinking of blogging that something a business does in addition to “real work” you have to change your mind into thinking that business is something you do as a result of blogging. In other words, blogging first, business second. Start each day with a blog post and your business will do better online. Plus, there is plenty of evidence to show that blogging has other “hidden” benefits, such as making your employees feel more positive towards your company and reducing any levels of depression. As a result, blogging actually increases productivity, not reduces it. If you want a thought-provoking guide to business blogging click here to get the download.